Most meat-based curries from the sub-continent use lamb, mutton or goat as their core ingredient. Beef isn’t used widely, mainly for religious reasons…the Hindu sacred cow is never destined for the pot. Traveling around India, you quickly become used to the sight of cows wandering around the streets, unflustered by the traffic mayhem around them, a sense of calm and wisdom reflected in their deep, black eyes. This isn’t the case across the whole of the country, or in other close-by states. Sri Lanka has a predominantly Buddhist population, and the consumption of beef is more widespread, despite huge commonalities in both language and culture with it’s enormous neighbour. 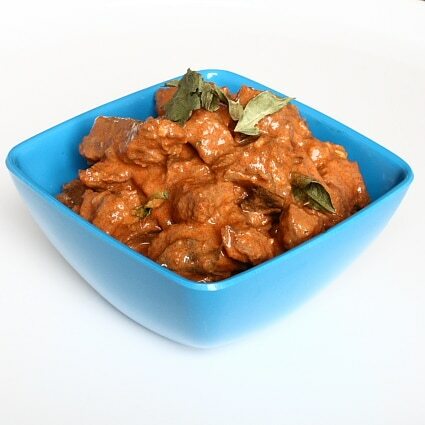 This is a typical Sri Lankan red beef curry. It uses a lot of paprika and cayenne pepper to create a bright but earthy red colour. It has the look of a dish from the south of the sub-continent, heat and fire cooled with coconut milk. Chop 450g of stewing beef into big chunks and place them in a bowl with a teaspoon each of ground coriander, ground cumin and ground fennel. Add half a teaspoon of cayenne pepper, two or three teaspoons of bright red paprika and plenty of ground black pepper, mix thoroughly and set aside for half an hour, so that the spices can flavour the beef properly. You could do this the night before and leave the beef in the fridge. The flavours will develop and intermingle overnight, and the results will be quite astonishing. Heat a good glug of corn or groundnut oil in a large pan and add a stick of cinnamon, four whole cardamom pods, half a teaspoon of fenugreek seeds, four tablespoons of finely sliced shallots, two cloves worth of sliced garlic, two thin slices of fresh ginger, a five centimetre piece of fresh or frozen pandanus leaf and a small handful of fresh curry leaves, although dried will do at a pinch. Phew. That’s a lot of ingredients. Stir them around in the oil for a few minutes until the shallots and garlic start to cook through, then add the meat. Carry on stirring for a few more minutes to lightly brown the meat, add a teaspoon of salt, two squeezes of lemon juice and pour over 350ml of water. Bring to the boil, cover and reduce the heat to a simmer. Cook for an hour and twenty minutes, maybe longer, until the meat is very tender. Finally, add a can of coconut milk and stir it in gently. Check the seasoning and serve with plain boiled rice. I have a small confession to make here. I cooked this the other day and left it in the fridge so that Jen could feed some guests quickly and easily whilst I was traveling back home from a business trip. When I finally arrived home, I found that our diners had been forced to go out and buy some plain yoghurt to take the edge off the heat further. It was quite warm, I’ll admit, but it had a rounded flavour as well, instead of just sharp, stabbing heat. The worst curries are the ones that just blow your socks off with a fierce blast of chilli and then have nothing left underneath it, no depth of flavour or secondary layers of spicing. This one is most definitely not one of those curries. This recipe is from Madhur Jaffrey’s Ultimate Curry Bible. Ah, yes, the wandering cows…. This recipe looks wonderful – will have to try it! This looks and sounds awesome! We like foods with a fair amount of heat in them, so we may have to give this a try! I am not a seasoned curry eater, but this does sound awfully good! First time I've come across a beef curry. Ooo I love a hot curry. I'll be trying this! Love Curry. This sounds and looks delicious!